What do you do about a problem like Syria? ZillaMod — All eyes rest on the United States the week world leaders are flown into Russia for the G-20 Summit. US presence is in question for attempts to consequence to Syrias democidal government. To date, the Senate has 90 days to evaluate Secry. John Kerry’s proposal to launch a “limited military strike” on the Syrian government. This comes without direct calls to do so by the Syrians themselves and overwhelming opposition by America’s constituencies, Britain, UN and NATO partnering allies abroad. The incidence of a US led military strike is seen as very sudden as the Assad regime has persisted for at least 2 years to date. As foreign reporting surfaces, multiple layers of influence in the region become apparent. The matter is over use of chemical weaponry vs. the legality of invading a sovereign nation to to remedy a humanitarian crisis. Most sense the intent to manufacture war cause for unconfirmed evidence of a chemical weapons attack during Syria’s civil war. First let’s look at who supports a pre-emptive move on Syria. Israel is busy baiting the United States to move on the Syria because they have sent in war planes to bomb. France’s Prime Minister attempts to act alone but only to follow a decisive lead of the United States. The UAE fully supports a military move on Syria. Until other notice, dignitaries from these countries will make an appearance at G-20. Radicalized tribes of Islamists also want the US to move so the can seat themselves conveniently as Syria’s government. There is significant doubt they will be greeted as revolutionary liberators by the Syrians. There are reports of hundreds of radicalized Islamists applying to work at the CIA, according to KBTC-TV. Apparently doubling up as a radical Islamist/Westernized informant is an employable position in todays Middle East. If that isn’t confusing enough, there are abundant reports of Syrian strongholds on the ground saying a sovereign led revolution to depose Assad is within reach. This news comes despite thousands of Syrian refugees leaving the nation to avoid death and violence. No future Syrian leadership is available to be coached or vetted in the midst of their civil war by Western interests; which many fear will keep the country destabilized with or without US involvement. Yet, Secretary Kerry is busy busy busy defending his actions urging the US to move on Syria. He may not make it to Russia personally to discuss G-20 issues this week. He’s certainly got a good excuse as he is currently stationed in Congressional war hearings at the moment. That still may not successfully distract G-20 nations from confronting the United States about invasive surveillance practices with the UN and European allies and the future of the US dollar as a global currency standard. At some point someone might complain about the duplication of data surveillance efforts, similar to the US Echelon program amid English speaking countries. Not to mention the humilation of submitting attendance in the same country that hosts US intelligence whistleblower, Edward Snowden, for political asylum. It really is an awkward time for US-Russian relations right now. While not directly apparent, the United States and some proponents of global currencies are in the percussive section of a call to war in Syria. If you get past the noise of Assad’s immediate troublemaking, you can see financial pressures coming from global markets. Germany is hosting a puppetted election where no one chooses to discuss the crippled Euro currency responsible for massive foreign debt leverages. France maintains faith that Euro will work, as in fact it continues to bankrupt and decimate weak or broken economies like Cyprus, Spain and Greece. In the meantime, the value of Canada’s loonie, shot up within days of a US announcement to move a military strike into Syria. Russia has the unfortunate burden of playing host to this International bag of cats. Ironically, they are also one of Syrias few allies defending thier State’s soverignty, with defined interest. Russia, China and Turkey maintain energy independence from Western oil interests due to a petroleum pipeline bordering Syria. US national security interests in a destabilized Syria now clarifies as the perennial partnership of middle eastern oil mobsters and the US military industrial complex. The UAE, Israel and France are agitating US dominance over oil interests which could very well stoke a 3rd and unending world war. The problem with world wars is they invade global borders. The UN and various NATO partners have had limited success in public disarmament endeavors of the American people. If a global war arrives in the Contential US, these interests know the US people are armed to the teeth. They will defend themselves, some in tandem with refusal to participate willingly in a global war led by oil and fiat financial interests. As fattened buzzards of Middle Eastern war circle from abroad, one this is sure: the American people are still recieving their war wounded from Iraq and Afghanistan. 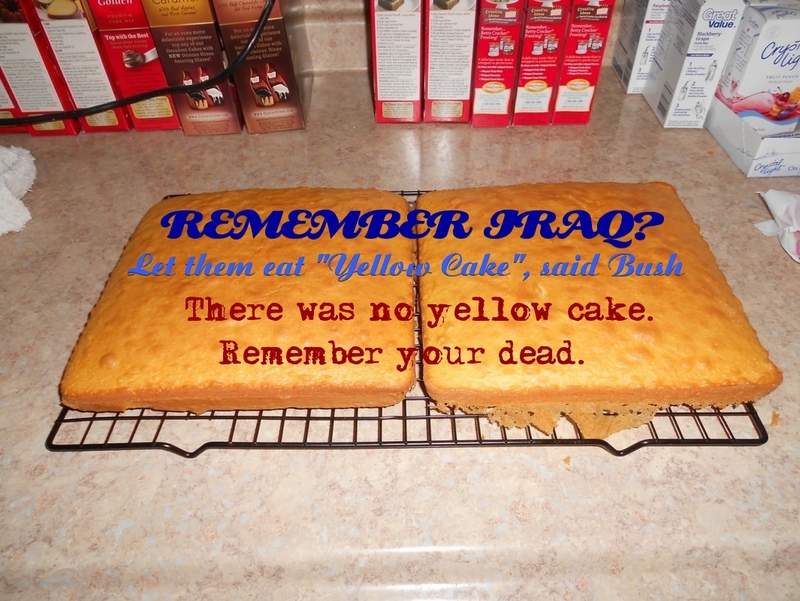 They remember “yellow cake” as the unconfirmed excuse why they hold broken and suicidal family members in their arms one minute, to be redeployed to endless personal damage in corporatized military service the next. The American people aren’t burying yellow cake from Iraq. They are burying family members. They don’t have any to spare for Kerry’s oil hegemony in Syria.